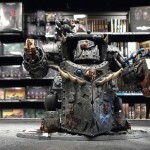 As most blogs are understandably concerned about incurring the wrath of Games Workshop, they tend to avoid saying anything that might be considered too critical of the company. This includes an honest discussion of recent prices. Thankfully, I’m not concerned with any such thing. I’ve dealt with their “mighty roar” and it doesn’t bother me as much as holding my tongue on such a topic. I must admit that another part of my motivation for writing this is that I’m frankly sick of such blogs and websites shutting down any such criticism. While they allow people to take an offensive tone toward those who question Games Workshop, you might find your own comments being moderated and not allowed if you disagree with such people. That in and of itself is a concerning trend, but not one I’m here to talk about today. The model that sent me over the edge was the recent Ork Mek Guns kit. 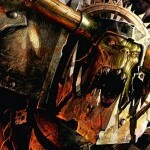 The new Ork releases have been a test of patience to this point with the pricing. First was the Gorkanaut/Morkanaut at $105. One could try to excuse that by looking at the Wraithknight or Imperial Knight as price points for it. Then came the Flash Gitz, brilliant models, but $53 for five models, making a unit of ten a cool $106 plus tax. Finally came the Mek Gunz, new Ork artillery with must-have rules. I’m serious about the “must-have” part of that. The Ork army is currently sorely lacking in ranged AP1 and AP2 weapons and anti-air capabilities, and the Mek Guns cover all of those well. But the price sheet from the upcoming White Dwarf has been leaked, and these models come in at $46 per gun. A battery of five will be a major boon on the battlefield, and tops out under 200 points… but will set you back $230. And that’s to say nothing of getting multiple units. Each gun costs more than many tanks and monstrous creatures do. Heck, a trio of Killa Kans will only set you back the price of one gun. This is a trend that’s been spreading throughout Games Workshop’s games. The codices and army books were made hardback so they could boost the price to $50, but that’s not the worst part. The worst part is the $50 supplemental books, which require you to already have the $50 core book. These books are smaller to start with, and are padded with rules for Cities of Death and Planetstrike, two supplements that have been discontinued, making those padding pages useless. 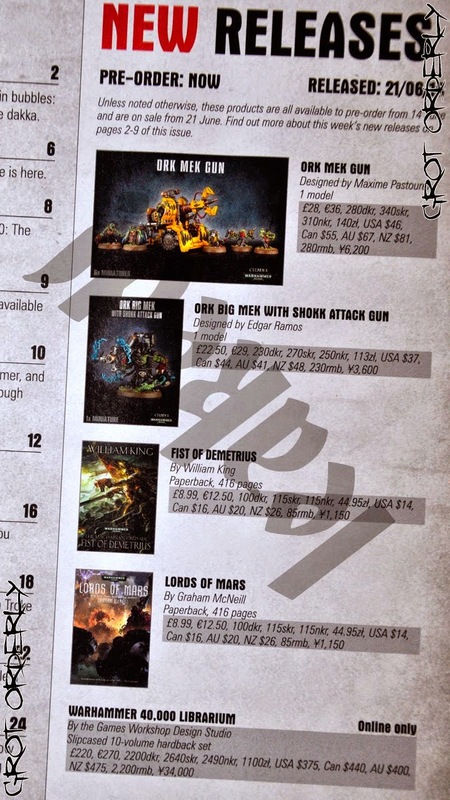 Supplemental rulebooks are also pushing to draw out your dollars, whether it’s the $75 Apocalypse, $85 Triumph and Treachery for Warhammer Fantasy, $33 Stronghold Assault, or $50 Escalation. Escalation came out in December and has already seen all of its core rules replaced by the new rulebook. It’s not necessary unless you want rules for super-heavies included in it, or the missions that most people won’t bother playing. Stronghold Assault, however, found a way to make itself a continued must-buy. All fortification rules, including the basic Aegis Defense Line, were removed from the core 40K rulebook with the release of 7th edition, leaving the Stronghold Assault book as the only place to find those rules. Warhammer Fantasy Battles has fallen victim to the model pricing, where recent boxed sets of ten models are being released at $50 or, in the cast of the Witch Elves, $60. When you look at Dark Eldar Wyches and see similar models for $29, it becomes even more evident that these prices are being arbitrarily assigned, in the hopes that desire for an effective unit will drive people to pay far more than they reasonably should. So then, what should you do? I mean, it would be remiss to just present a problem without presenting a solution as well. Luckily, I have a few ideas. There are a number of ways to achieve this first step, but they all fall under the same basic category. It can be as simple as buying different models from Games Workshop to convert into or use as the models you want. With the above example of Witch Elves, you could get Wyches and tweak them a bit, put them on square 20mm bases, and use them instead, thus still using Games Workshop models at half the cost. Instead of paying $40 for a Tzeentch Herald on a Disc, you can get a Flaming Chariot kit for the same price and use the parts in it to make a Tzeentch Herald on a Disc, two Screamers of Tzeentch, and an Exalted Flamer. If you look to other manufacturers, you can sometimes find a kit that works well for a better price. Continuing with Witch Elves, there’s one manufacturer that sells a unit of thirty for $48, so you get three times as many for 80% of the cost. They also have twenty Dwarfs for $48. These models are comparable quality to Games Workshop, for a good bit less. You can find a lot of other models that are at least serviceable and cost less. It depends on your personal tastes. The only downside is that you can’t use these models in a Games Workshop store or official Games Workshop event. But if you game at an FLGS or with a club, that’s not really an issue. The final option, and one that I’ll employ with the Mek Guns, is scratchbuilding. Warhammer 40,000’s first rulebook, Rogue Trader, even had a picture of a tank made from a deodorant stick container. One of the earliest photos of Space Marines included a G.I. Joe tank converted and repainted for 40K. The games have moved away from this spirit of ingenuity, and people assume that everything must be stock. Nonsense! Break out some plasticard and bits, and hammer out a conversion. I have a bag of vehicle bits that GW used to sell specifically for converting Ork stuff, and I intend to use them to make me some Ork guns for a lot less than $200. With the rising cost of rulebooks, supplements, and even the army books, one option that’s possible for clubs is to create a “community library.” The entire club pitches in and purchases core rulebooks, supplements, and possibly even army books, which individual members can then borrow. Only one copy of Apocalypse or Triumph and Treachery is really needed to play a game of either. You could even take it a step further and build simple armies for people to borrow. This would also let players test new armies without having to drop a bunch of their own money on said army. Technically, it’s a solution… but more of a “final solution.” This is the go-to for all snarky trolls who sit waiting for people to comment in any way negatively about Games Workshop. The problem is that a lot of us have invested quite a good deal of money already into our armies and rules sets, so setting them aside in order to go start up a new game isn’t always easy. I have an apartment that is stuff full of literally more than two decades’ worth of Games Workshop models (and this isn’t even the entire collection my dad an I had, much of it was lost to a house fire). If I set aside Games Workshop games for good, that would be thousands of dollars now doing nothing more than collecting dust. 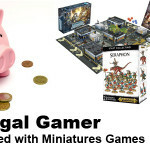 Thankfully, not everyone has such a huge collection, and people who are newer to Games Workshop games can opt to go in another direction without losing more than a few hundred dollars’ and a few months’ investment. If that’s the route for you, then you’re spoiled for choice right now. There’s Flames of War and Bolt Action for WWII fans. There are miniatures games for Napoleonics and Ancients eras. There are a number of sci-fi games, from Dystopian Wars to Dropzone Commander and Warzone Resurrection. 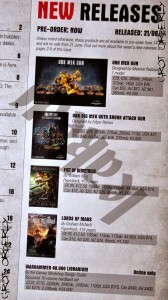 There’s the Privateer Press games, Warmachine and Hordes. There’s also the increasingly popular X-Wing Miniatures Game, which you can pick up a core set and expansions from such places as your local book store. If you can afford it, it’s worth branching out into some other games just to broaden your gaming and modeling horizons.